New Delhi : The Niti Aayog recently came out with its ‘Three Year Action Agenda’ – a plan that covers a time period that is politically crucial as it leads up to the 2019 Lok Sabha elections. In its chapter on agriculture titled ‘Agriculture: Doubling Farmer’s Incomes’, the economic think-tank has put forth a four-point action plan to double the incomes of India’s farmers. Although there is nothing radically new in what has been suggested by the Niti Aayog, the measures proposed are in the right direction if the farmers’ incomes have to be doubled. However, various experts have cast a pall of gloom over the claim that is indeed possible to double incomes by 2022-23. This is primarily because agricultural growth in the post-reform period, barring a few exceptional years, has been stagnant and has historically failed to meet the target set by the government. For example the average annual rate of growth in agriculture and allied sector during the period from (1991-92 to 2013-14) comes at 3.2% – lower than the targeted 4%. The four point action plan includes the following measures: 1) Remunerative prices for farmers by reforming the existing marketing structure; 2) Raising productivity; 3) Reforming agriculture land policy; and 4) Relief measures. It is important to see how these actions will double the income of the farmers’ and to what extent the government is serious about it. At the outset it is important to highlight the current state of Indian agriculture, thus setting the context for our quest to double farmer income. It must be noted that agriculture and allied activities remains the main livelihood for more than half of the Indian population. The Socio-Economic and Caste Census (SECC) 2011, released in 2015, also indicates that out of 24.39 crore households in the country, 17.91 crore lived in villages and are more or less dependent on agriculture. Further, the Economic Survey of 2015-16 highlights that the share of agriculture in employment was 48.9% of the workforce while its share in gross domestic product (GDP) was 17.4% in 2014-15 at constant (2011-12) prices. Additionally this year’s Economic Survey projects the growth rate for the agriculture and allied sector for 2016-17 to be 4.1% on the basis of the first advance estimates of the Central Statistics Office. With this backdrop it is interesting to dissect the Niti Aayog’s four point action plan. Under this point, the Niti Aayog has suggested reforms in two areas: marketing reforms and minimum support price (MSP) reform. However it must be noted here that since agriculture is a state subject, the central government cannot do much here apart from facilitating the reform process. Under marketing reforms, the think-tank has highlighted as to how currently existing agricultural marketing – under the Agricultural Produce Market Committees (APMC) acts in various states – has led to policy distortions and fragmentation, largely as a result of a huge number of intermediaries and poor infrastructure. The plan highlights that because of the APMC acts, farmers are required to sell a large number of commodities in local mandis where different layers of intermediaries often manipulate the price, thus depriving them of their fair share. 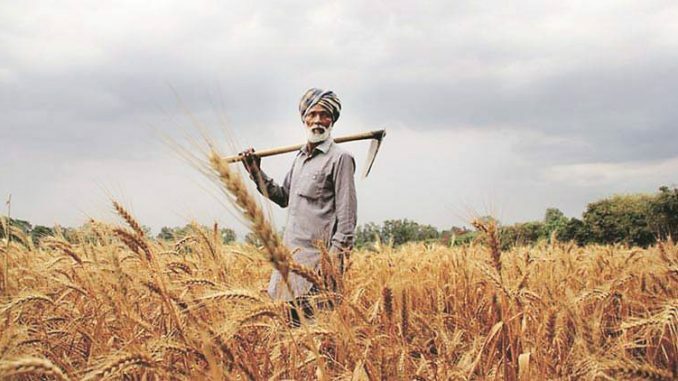 Sukhpal Singh and Shruti Bhogal in their analysis in Economic and Political Weekly, highlight how farmers have become dependent on commission agents because of the intermediary culture propagated by the present APMC acts. They further, using the data from their field study, highlighted how these intermediaries trap the farmers in a vicious circle of indebtedness. The impact of these intermediaries can be gauged from their study that reveals that almost 38% of Punjab’s total agricultural debt was channelled through non-institutional sources, the majority of which is usually financed by intermediaries to the farmers. Not only is the interest rate charged by the intermediaries exorbitantly high (sometimes even 20%) but they also force the farmers to sell his produce to them only. In order to address the shortcomings of the APMC acts, the central government circulated a model Agricultural Produce Marketing Committees (Development and Regulation) Act of 2003. However, as the Economic Survey of 2013-14 observes that despite this, states have failed to address monopolistic and uncompetitive practices in the inter-state trading of agricultural products. Further, the Committee on Agricultural Reforms (2013) noted that, “By and large, the APMCs have emerged as some sort of Government sponsored monopolies in supply of marketing services/ facilities, with all drawbacks and inefficiency associated with a monopoly”. In this background, it will be interesting to see how new reforms – with regard to empowering farmers to sell their produce to whomever they wish and allowing actors other than APMC mandis to buy produce – are embraced by India’s states. If one goes by past experience, it is not a rosy picture. For example as of February 2, 2016, only 21 states and union territories have allowed the establishment of private market yards/ private markets managed by a person other than a market committee and this is only one of the numerous proposed reforms. On other reforms the number of states which have reformed the act is much less. The MSP regime in India has been a subject of heated debate in recent years. MSP is not only increasing year by year but since the mid-1990s the rise in the MSP has been sharper than the rise in consumer and wholesale price indices. The major disadvantage of MSP regime is that it totally ignores the demand dimension, thereby resulting in not only an inefficient use of resources but also accumulation of unwarranted stocks of cereals. Since resources for agriculture – water and land – are scarce, it is very important to use the resources efficiently if our aim is to double the income of the farmers. The Niti Aayog has aptly highlighted the distortion in cropping patterns caused by MSP regime. Since the MSP regime favours cultivation of wheat, rice and sugarcane, not only has it led to reduction in the area under acreage of other crops like pulses, oil seed and coarse grains but it has also led to, as highlighted above, accumulation of unwarranted stocks of cereals. While the Economic Survey of 2015-16 pitched for replacement of SP/procurement based PDS with DBT and freeing the market control on domestic movement and imports, the Niti Aayog, on the other hand, has suggested a system of “price deficiency payments” to cure the distortion caused by the MSP regime. Under this system a subsidy would be provided on targeted produce in case the price falls below MSP-linked threshold. One advantage of this, as highlighted by the action plan, is that it would spread price incentives to producers in all the regions and all the crops considered important for providing price support. As per the Agriculture Census 2010-11, 67.10% of India’s total farmers are marginal farmers (below 1 h.a.) followed by small farmers (1-2 h.a.) at 17.91%. Since Indian agriculture is dominated by marginal farmers who have small holdings, raising productivity is likely the single most important factor if incomes of this group are to be doubled. But here also there are many challenges. First of all, on the one side resources like water and land are limited and on the other hand land holding is getting fragmented. The problem is further compounded by rising input costs. The Niti Aayog has also called for substantive investment in irrigation, seeds & fertilisers and new technology coupled with a shift into high-value commodities such as horticulture, poultry and dairying to double incomes. However, what must be noted here is that public investment required for all this is on the more or less continuous decline. Economist Ashok Gulati attributes the decline in public investment to the expanding subsidies on agriculture. However, this trend has been reversed to some extent since the 9th five year plan. Gross capital formation in the agriculture sector has gone up from 13.9% during the 10th plan to 19% during the 11th plan period. As Gulati and Surbhi Jain note, total public expenditure on agriculture (including public investment and input subsidies) as a ratio of GDP (agri) has almost doubled in the last decade from 8.6% in 1993-94 to 20.6% in 2009-10. This compares well with international trends. But almost 80% is in the form of subsidies and only 20% is investment in agriculture. The three major input subsidies are our fertiliser subsidy, the irrigation subsidy, the power subsidy. A fourth indirect subsidy is the credit subsidy; an interest subsidy on credit obtained from various financial institutions. A major portion of these subsidies is accounted by India’s fertiliser subsidy which has increased by around five times in the last ten years from Rs 12, 595 crore in 2001-02 to Rs 67, 971 crore in 2012-14 at current prices. In 2015-16, the government budgeted Rs 73,000 crore (about 0.5% of GDP) on fertiliser subsidy. While the Niti Aayog has called for the application of soil cards for customising fertiliser use, the Economic Survey of 2015-16 pitched for reforms to increase domestic availability via less restrictive imports and to provide benefits directly to farmers using ‘JAM’ (Jan Dhan, Aadhaar, mobile). As is it is clear that subsidies crowd-out public investment in agriculture, this makes a strong case for an expiry date for these subsidies. Though the Niti Aayog is curiously silent on this, this reform is highly political sensitive and it needs strong political will to bring in this reform as farmers’ lobby will strongly protest any attempt to cut subsidies. Further, massive investment is needed in irrigation if productivity of India’s farms are to be increased. But if we look at the budgetary allocation for the same, one is filled with a sense of sheer disappointment. For example, as Gulati and Jain note, at the beginning of the twelfth Plan, there were 337 major and medium irrigation projects requiring an indicative budget of more than Rs 4,22,012 crore. Against this need, the annual allocation for irrigation was less than Rs. 20,000 crore. The Niti Aayog has also mooted the modernisation of farms and adoption of new technologies like adopting GM crops and using new farm equipment. However, this is not as easy as it seems. For example as per Agriculture Machinery and Manufacture Association in India, tractor penetration is 38% for large farmers, 18% for medium farmers and just around 1% for marginal farmers. Since the majority of the farmers in India are marginal, the almost negligible penetration of tractors tells us as to how difficult it is to mechanise these farms. One idea mooted by the Economic Survey of 2015-16 is to develop a rental market for farm equipments. This is a good suggestion but again the hurdle is how to connect the various stakeholders involved in constructing such a market? The action plan’s suggestion that India’s farmer shift into high value commodities also finds support from one study conducted by S. Chandrasekhar and Nirupam Mehrotra. Using data from NSSO’s Situation Assessment Survey of farmers conducted in 2003 and Situation Assessment Survey of Agriculture households 2013, Chandrasekhar and Mehrotra argue that mere focus on cultivation cannot double the income of the farmers by 2022. They make a strong case of policy intervention aimed at increasing net income of farmers from animal farming. Given the political sensitive nature of reforms which will increase the productivity of farms, it is submitted that this poses a very big challenge before the government if it is serious about doubling the farmers’ income. Lastly the Niti Aayog has suggested bringing in far-fetched amendments in tenancy and leasing law so that small farmers who wish to lease their land do not face any hurdle. In this regard the think-tank has prepared a model Land Leasing Law. But again, since land is a state subject, response from the states has not been encouraging in this regard. On relief measures, the Niti Aayog has suggested many modifications in the existing Pradhan Mantri Fasal Bima Yojana. The action plan has suggested that the scheme should have a capped subsidy amount per farm household and any farmer desiring to insure larger sums should pay full premium for the difference. Secondly, the plan has also suggested extending the time period of coverage under the scheme for three to five years so as that coverage extends to both good and bad years. Both suggestions are good suggestions and there does not seem to be any problem to accept the same. Doubling agricultural income by 2022 is a mammoth task. It is also one that is the need of the hour. With majority of the country’s population dependant on agricultural activities, no true development can be said to be meaningful unless it incorporates the needs of this sector. Increasing farmer suicide rates and increasingly erratic weather patterns further add to the problem. There are, of course intense complexities. Nonetheless, the focus of the government on this sector is much needed. The walk to doubling income is a long, tedious one. But at least a step has been taken in that direction. We now need to ensure that the implementation by all stakeholders is uniform, effective and done whole heartedly. Vishavjeet Chaudhary is an assistant professor and Gursharan Singh is an agriculturist and law student at O.P. Jindal Global University.